without having to re-invent the wheel. Keep in mind the very simple facts. 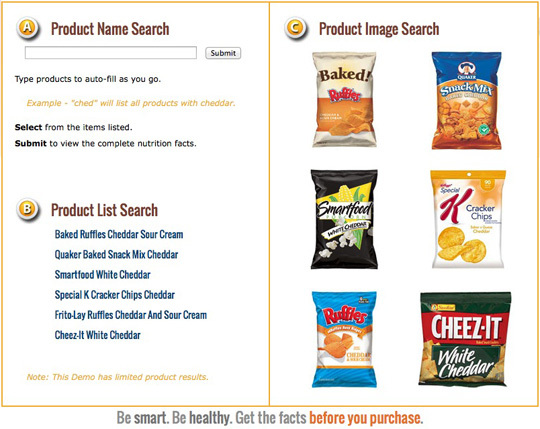 Nutritional facts are printed on packaging, and nutritional facts are available online. Product packaging changes, and online sources are for the most part inaccurate. We have developed a database of vending and food-service products to resolve this issue. Our database takes into account future product changes (from ounce servings to new packaging photography), which is updated in real-time to your Membership Package. Contact our Graphics Team by selecting the Contact Us - Software Division button to the right. Our online form will take a few minutes to complete. This will allow us to best address your needs. A Membership Manager from our Software Department will contact you shortly. Take a tour of our online database to see how it works. Our online demo is limited to a variety of products that include typical snack, healthy snack alternatives, and specialty items. We will gladly customize your Membership to reflect your product inventory. Read articles and view recent news videos about the healthcare law and how it affects the vending industry.